The Carnegie Libraries in East Texas. 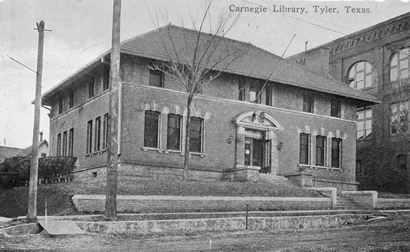 When Tyler’s historic Carnegie Library building celebrated its anniversary, the event reminded East Texans of the legacy Andrew Carnegie left before his death in 1919. 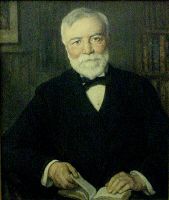 Carnegie, a Scottish-born steel magnate, helped create a network of public libraries across America in the early l900s. Before he launched his effort, the country had only about 600 fledgling libraries. By the time he was done, the nation had added nearly 1,700 more. In East Texas, the Carnegie legacy continues in the communities of Tyler, Jefferson, Marshall, Palestine and Franklin. Some of the towns’ Carnegies have remained libraries while others serve different community roles. Carnegie buildings, however, have vanished in Clarksville, Pittsburg, Sulphur Springs, and Winnsboro. Opened October 3, 1904, now serves as the museum and archives of the Smith County Historical Society. Tyler’s Carnegie is the home to the Smith County Historical Museum and houses a wonderful collection of materials related to the county’s history. Tyler is currently raising nearly a half-million dollars to give the building a centennial facelift. During the Depression, the building acquired murals entitled “Industry of East Texas,” painted by Dallas artist Douthett Wilson. Palestine’s Carnegie today houses the Chamber of Commerce in a Prairie one-story and basement building with a series of graceful arched windows across the facade. The interior is almost original. At Franklin, the Carnegie is similar in design. It served as a library for only a few years after it was built in 1914 and today houses classrooms and shop classes for the Franklin school district. Jefferson’s Carnegie is still maintained as a library six days a week and Marshall’s Carnegie is used as an administrative building on the campus of Wiley College. The public libraries Carnegie built didn’t come cheap. Between 1890 and 1919, he spent $40 million of his own money for library grants. In Texas he also built one college library and a lecture hall. Appropriately, the Pittsburgh-based philanthropist began his Texas grants at Pittsburg in East Texas with a gift of $5,000 in 1898. Carnegie had a good personal reason for building libraries. Growing up in Scotland, he had seen his father persuade his fellow weavers to pool a portion of their salaries and buy books, which were read aloud as they worked. When he was twelve, after his family came to America, Carnegie wrote a letter to the Pittsburg newspaper, seeking public access to a private library which, to that point, had been reserved for mechanics and tradesmen. Carnegie never forgot the opportunities libraries gave him during his career. But a town didn’t get money for a library because it requested one. It had to provide a location for the building and annual taxes to support the library. If the library proposal had been up to Eugene Debs, an American socialist leader, no libraries would have been built. Debs believed Carnegie’s money came from an unfair capitalist system and, as such, no one should take any of it.